V.K. Dhir, Heat Transfer from Heat Generating Pools and Particulate Beds. J.H.S. Lee and M. Berman, Hydrogen Combustion and its Application to Nuclear Reactor Safety Issues. T.G. Theofanous and D.F. Fletcher,Heat Transfer and Fluid Dynamic Aspects of Explosive Melt-Water Interactions. M.M. Pilch, M.D. Allen, and D.C. Williams, Heat Transfer during Direct Containment Heating. Subject Index. Advances in Heat Transfer is designed to fill the information gap between regularly scheduled journals and university level textbooks by providing in-depth review articles over a broader scope than is allowablein either journals or texts. 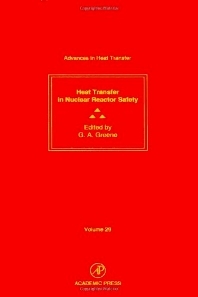 Volume 29 is a special volume devoted to nuclear reactor safety. Nuclear and mechanical engineers, especially those working in the field of heat transfer and nuclear reactor safety; chemical and civil engineers in research, graduate schools, and industry. University of Illinois, Chicago, U.S.A.
State University of New York at Stonybrook, U.S.A.
Brookhaven National Laboratory, Upton, New York, U.S.A.